Industry figures suggest that the use of mobile as a sales channel has increased to around 20% of all ecommerce transactions for some merchants. To take advantage of this increasingly lucrative sales channel and ensure the best possible chance of achieving higher conversion rates, merchants need to adapt to this environment by making sure the checkout process remains as seamless as possible. Whether you&apos;re developing an app for speed, availability and a slick user interface, or a mobile website for instant access, device-compatibility and ease of being found and shared, we&apos;ll make it simple to accept mobile payments. Whichever solution you choose, your customers&apos; card data will be stored on our secure platform so it&apos;ll be much easier to make your app or mobile website PCI compliant. Plus you&apos;ll be able to monitor, manage and reconcile your mobile payments in no time with our comprehensive reporting suite. If you&apos;re developing a mobile website and want to accept payments directly, we can help you design and host your own mobile payment page. 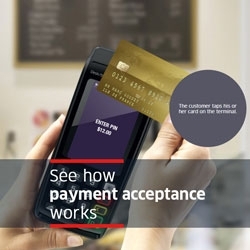 Through this implementation, customers on your mobile website are automatically redirected to the Ingenico Payment Services’ secure payment page to process the payments. The payment pages are fully optimised for mobile display on Android, IOS and Blackberry and support all the local, international and alternative payment methods offered by Ingenico Payment Services. You can easily adapt its look & feel to match the look & feel of your mobile website. If you&apos;re developing an app and want your customers to make quick purchases, you need one of our in-app payment libraries. Not only will customers be able to make payments directly from within your app, they can also save their card details so they can make faster repeat purchases. An in-App payment library (software development kit) is a software component that can be embedded with minimal integration efforts into your native mobile app. Your customers will complete their payment without leaving your mobile app to reach an external browser thereby ensuring a more seamless checkout experience. Available for both iOS and Android, these software components are regularly updated so they strictly adhere to the latest guidelines. They&apos;re easy to embed, plus you can customise the interface and match it to your app&apos;s look and feel. With one of our pre-built libraries, your app will be on the market in no time.